If you’ve never been to Lake Barkley State Resort Park, you seriously have got to get a move on. Boots Randolph Golf Course, Lake Barkley Lodge, Windows on the Water Restaurant, the Marina, cabins, campsites, volleyball, hiking trails, a fitness center, and (the main attraction!) beautiful Lake Barkley are waiting for you. As you probably already know, Michael (my husband) and I visit Kentucky State Parks regularly. We see the ones that are closest to us (Rough River Dam State Resort Park, Kentucky Dam Village State Resort Park, Kenlake State Resort Park, Lake Barkley State Resort Park, Mineral Mound State Park, Barren River Lake State Resort Park, Lake Malone State Park, Lake Cumberland State Resort Park…) on a regular basis. Like favorite cities, restaurants, or stores, each state park has its own characteristics and attributes that make it special. Things that make it stand out. You know, the things that immediately come to mind when you hear or read a name. These are the things we try to capture when taking pictures and try to explain when putting experiences into words. Outstanding food in the lodge’s Windows on the Water Restaurant. Beautiful deer, herons, and other wildlife. You, of course, don’t have to be a guest of the lodge (or cabins) to visit the lodge, shop in its gift shop, or eat in the beautiful and delicious Windows on the Water Restaurant. Lake Barkley Lodge is somewhat like an over-sized hunting or fishing lodge set deep in the woods, right on a big, beautiful lake. It’s kitchen happens to be a restaurant, it’s living room is a lobby, it’s “man cave” is a game room, and bedrooms? It has 120 of them, plus 4 suites. Who wouldn’t want to stay in an overgrown hunting lodge. I’ve never hunted a day in my life, but even I’d be… excuse the pun… game. Most of these rooms have private balconies with views of Lake Barkley. The lodge’s game room is downstairs. It has video games, pool and ping pong tables, and checker tables. There’s also a big, beautiful aquarium downstairs that I’m mesmerized by each time I walk by. Georgetown University Law Center Bernard P. McDonough Hall, Washington, D.C.
And many, many, many more around the world… including Lake Barkley Lodge. Seriously, how cool is that? 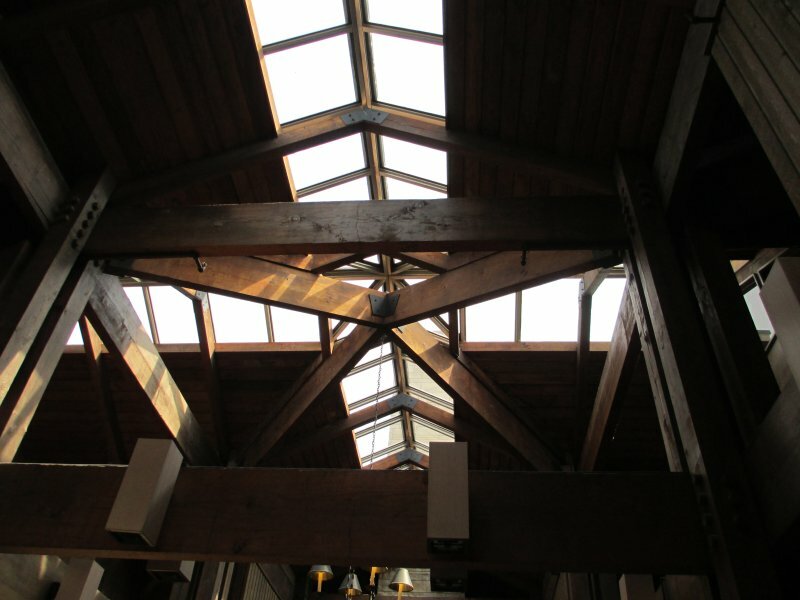 Lake Barkley Lodge’s post-and-beam wood construction of Western Cedar, Douglas fir, and three-and one-half acres of glass is a real work of art. Be sure, when you go (why not this weekend?! ), to look UP, DOWN, and ALL AROUND when in the lodge. I don’t want you to miss a thing. Like all Kentucky State Resort Parks, the lodge’s lobby contains a lot of history and sets the tone for the entire park, in my opinion. 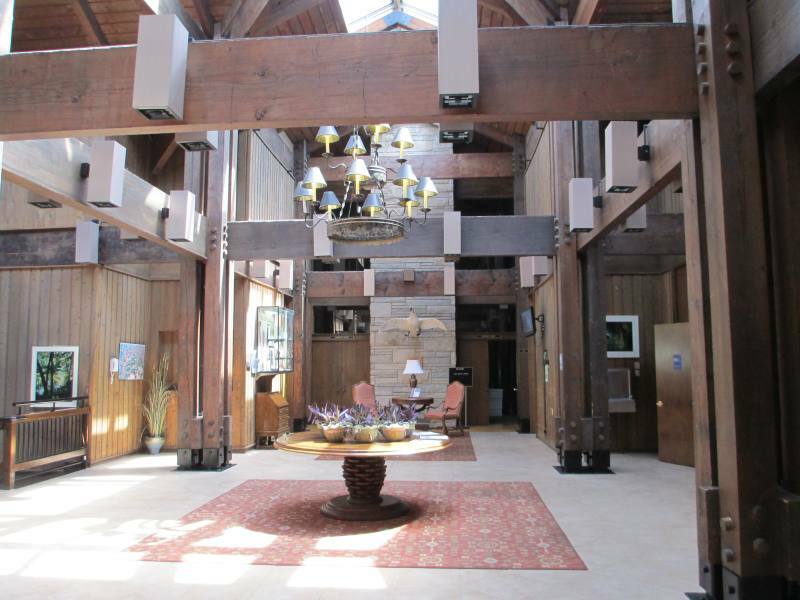 Lake Barkley Lodge’s lobby is as comfortable and relaxing as it is beautiful. There are beautifully upholstered sofas and winged chairs that are ideal for sitting in after eating a great meal downstairs in the Windows on the Water restaurant. This is one of the best restaurants in the entire State Park System. The entire staff is simply outstanding. A display case stands in the lobby featuring personal effects and historical information of Alben Barkley.Ã?Â Ã?Â The Graves County native Alben Barkley was a U.S. Senator and congressman from Kentucky. He was also the Vice President of the United States under President Harry Truman. Remember how I told you earlier that you’d want to look UP? That’s because vast ceiling spaces are crisscrossed with wooden beams and are open to views of the sky and lake. Three and a half acres of glass were used for windows and skylights! The Windows on the Water Restaurant has three-story walls of glass with beautiful views of Lake Barkley. There are 400 seats and there isn’t a bad one in the restaurant. Windows on the Water also has a beautiful fireplace and is always seasonally decorated. If you step out onto the patio, you can sit and enjoy a scenic view of Lake Barkley with passing boats and lake birds. Apparently, during certain parts of the year, you can even expect to see pelicans and eagles! Beneath the patio, you’ll notice a huge swimming pool overlooking Lake Barkley. The pool, which is available to lodge guests, reminds me of pools in Florida. You simply overlook a lake instead of an ocean – and, let’s face it, lakes are every bit as pretty… and no sharks! The lodge also has a great gift shop, located right off the lobby. Shop for souvenirs depicting the local wildlife, such as birds, deer, horses, raccoons, frogs, hummingbirds, etc. There are also a lot of hats, t-shirts, sweatshirts, mugs, magnets, postcards, Kentucky crafts, candy, jams, jellies, etc. There are nine 2-bedroom, 1-bathroom cottages with lake or woodland views. They have screened porches or decks. The park has four log cabins which I think are extra special. I don’t know, there’s just something about a night in the woods in a log cabin. The 8 site campground has utilities hookups. There are several wooden decks for picnics in the woods. There’s also a boat ramp for camper’s exclusive use. Open from mid-March to mid-November. A gorgeous bison at the nearby Elk & Bison Prairie. 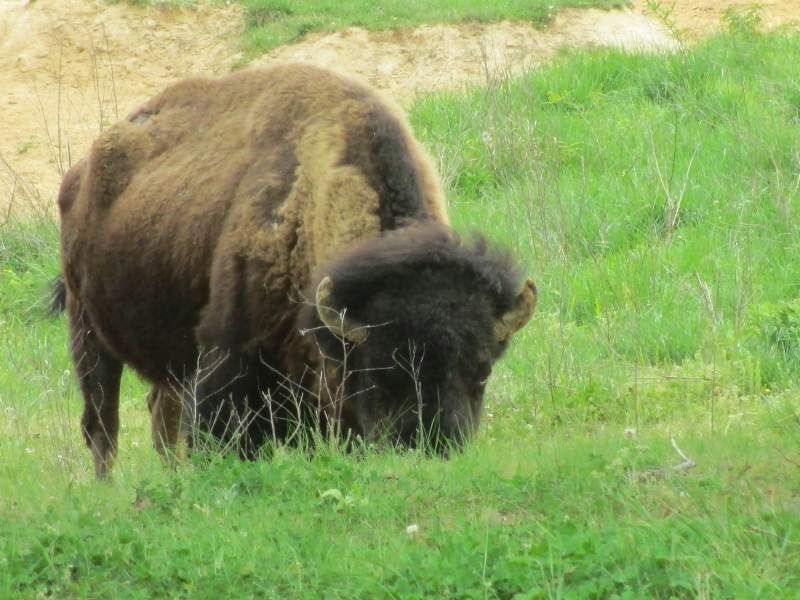 For just $5 a vehicle, you can drive through the beautiful Elk & Bison Prairie. Drive around as many times as you want! Keep your eyes open, you can see everything from elk and bison to skunks and racoons. Many times, a herd of bison will be lying right by the road. These majestic animals are really something else when you see them in person. Birding. 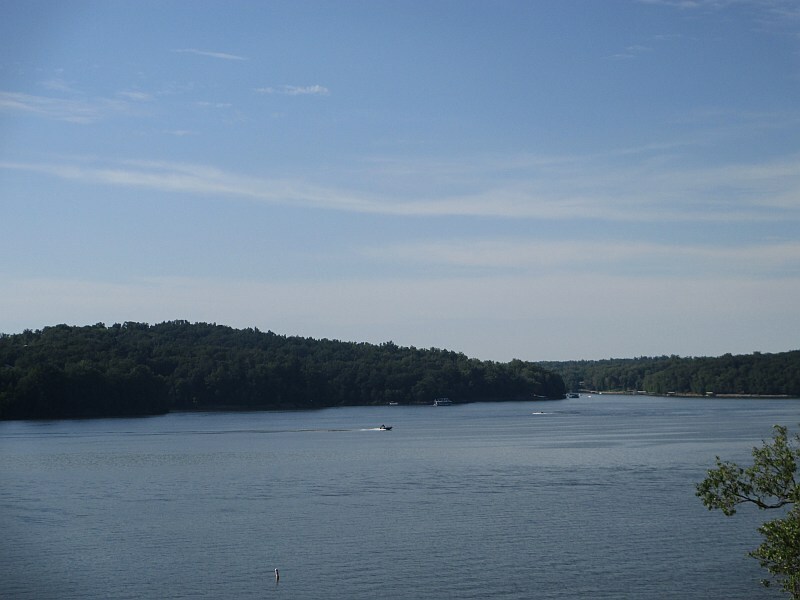 A canal connects Lake Barkley to Kentucky Lake, forming the largest engineered body of water on earth. Together, these two beautiful lakes have a little over 1,000 miles of shoreline and almost 187,000 acres of water. With this much water, I don’t have to tell you how many amazing birds migrate to this area! Wintering American bald eagles are popular in the area and, as I mentioned earlier, pelicans can be seen during certain parts of the year. Herons and other birds can be enjoyed effortlessly. From Kentucky State Parks: Over 200 avian species can be observed or heard in the park, including an abundance of warbler species including: Prothonotary, Kentucky, Blue-winged, and Worm-eating warblers, Bald Eagles, Ospreys, Wild Turkeys, vultures, Pileated Woodpeckers, Red-Headed Woodpeckers, Wood Thrushes, orioles, tanagers, hawks, owls, Belted Kingfishers, swallows, a wide variety of waterfowl, and many, many others. Golfing. Boots Randolph Golf Course is more than just a great name (but, really, isn’t that a super cool name?). This is a very popular 18-hole golf course. A pro shop, rental riding carts, pull carts, and golf clubs are available. Golf packages are offered. Course open year-round, weather permitting. Photography. Everywhere you look you’ll find a photographic moment waiting. In addition to a huge variety of birds, Deer are plentiful at Lake Barkley State Resort Park. Sailboats, a gorgeous lodge, Lake Barkley, woods, a marina.. photographers will find themselves in Paradise. Hiking. The park has five marked trails from 0.3 mile to just over 2.5 miles long. Many of these trails intersect, so you can make your hike even longer if you dare. The terrain is wooded and rugged, so even the short hike will give you a great cardiovascular workout. 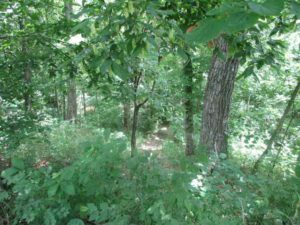 The self-guided Interpretive Trail (0.75 miles) takes about 45 minutes to walk and takes you along Lake Barkley, through the woods, and even over a swing bridge. Oh, and bring your camera! Land Between the Lakes Recreation Area is minutes away. 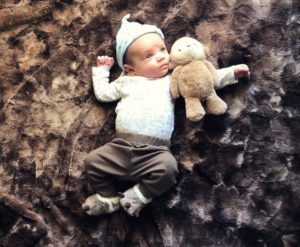 Here you’ll find an Elk & Bison Prairie, 1850’s Homeplace, and Woodland’s Nature Station. See pictures of each of these on our Land Between the Lakes Picture Album! Volleyball, Horseback Riding, Racquetball, tennis, and more! 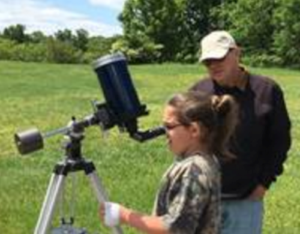 Click the link to learn about even more things to do at Lake Barkley State Resort Park. 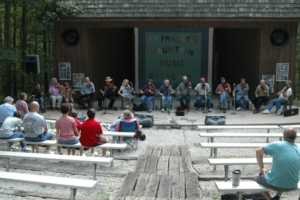 Kenlake State Resort Park, Mineral Mound State Park, and Kentucky Dam Village State Resort Park are all nearby. You could visit, enjoy, and photograph each in a very memorable day. See more pictures of Lake Barkley State Resort Park in our photo album section. Read all of our Lake Barkley State Resort Park posts for up to the minute news and events. We have made a few friends here, through the years, and are close friends of the “Bird People” here! Just a nice place to come !